Congress president Rahul Gandhi has put out a video on Twitter of his interaction with students, telling them that he would incorporate issues raised by them in Congress’ poll manifesto. “I met a group of really interesting students from all over India, for dinner a few days ago. I learnt a lot from the wonderful exchange of ideas & perspectives. Here’s a short video with the highlights of our interaction,” he wrote, using #ApniBaatRahulKeSaath. Mr Gandhi described the new initiative as first-of-its-kind. “I am Rahul Gandhi and I am president of the Congress party and I am a member of Parliament from Amethi. I thought I will have a chat with some young people and get a sense of what they are thinking,” he is heard telling the students in the video as he introduces himself to them. 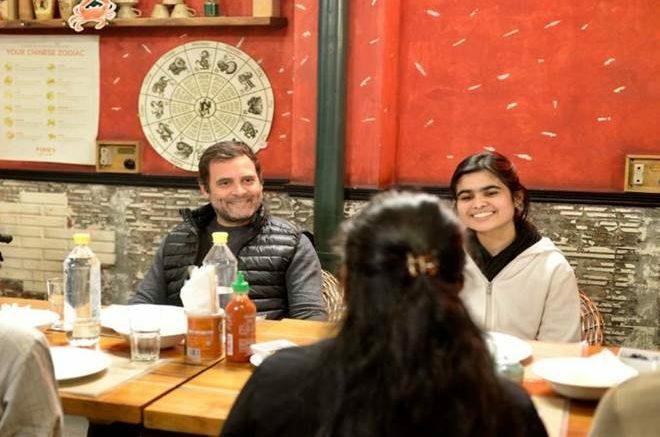 According to news agency PTI, Abhilash Karri, an IIT student from Mumbai, who was part of the meeting, recalled how surprised they were when they saw a beaming Rahul Gandhi walk into the dining area of an upmarket Chinese food joint late Friday evening where they sat. The students were told that will have an interaction with Congress party, but not that it will be the party president himself. The meeting was informally structured with Gandhi hearing the new age voters on their priorities for themselves and their countrymen. Among the invitees was an LGBTQ rights activist who suggested gender-neutral toilets for the trans people in order to ensure they are not body shamed. Kunal Ramteke of the prestigious Tata Institute of Social Sciences (TISS) said he discussed caste-based discrimination with Gandhi and described the Congress chief as one who is sensitive towards the issue. “I hope he will implement suggestions to end caste-based discrimination… His talk was very inspirational,” he said. During his conversation, Karri said he stressed on making education accessible to all by introducing a fee structure which can be afforded by the underprivileged. China was producing 50,000 jobs every 24 hours, whereas India was producing only 450, Mr Gandhi said, adding, “We are facing a massive crisis. “To another question on the Narendra Modi government, he said, “The basic idea of this government is to control. That means you want to control the Supreme Court, you want to control the Election Commission, you want to control the VCs (vice chancellors of universities), you want to control everything. That is the problem. Be the first to comment on "Rahul Gandhi meets students over dinner to discuss the issues faced by the country"